Arjan Singh,Padma Vibhushan, DFC, is a soldier’s soldier, much like the other two recipients of the honour, Field Marshals S.H.F.J. Manekshaw and K.M. Cariappa. It is the highest rank for an officer of the armed forces, and is equivalent of the rank of Field Marshal of the Army. He is also a man who effortlessly transcends stereotypes. This teetotaller gung-ho fighter is not only a committed soldier but also a diplomat. He is committed to his profession, and also a devoted family man. Lord Mountbatten, pining the Distinguished Flying Cross. Arjan Singh was born on April 15, 1919, in Lyallpur, Pakistan. He fought all the three major wars and built up the Indian Air Force virtually from scratch. Later, he went on diplomatic assignments to Switzerland and Kenya. He also served as the Lieut-Governor of Delhi, and has been an active conscience-keeper of the nation, whether in public office or out of it. It was on Republic Day this year that the 83-year-old warhorse was conferred the rank of Marshal of the Indian Air Force by the President of India. He had earlier been awarded the Padma Vibhushan. He was the first Air Chief Marshal of the Indian Air Force when, in recognition of the Air Force’s contribution in the 1965 war, the rank of the Chief of Air Staff was upgraded to that of Air Chief Marshal. All this sits lightly on his shoulders, as he relaxes in a comfortable, well-worn, leather chair in the warm, book-lined study. The book selection is eclectic — Winston Churchill’s collected works sit along with Paul Scott’s Raj Quartet and Philip Ziegler’s Mountbatten and an English translation of the Guru Granth Sahib. The man and what he says comes across with the clarity and forthrightness of a soldier. “I WAS always fascinated by aircraft flying. I first saw them when they flew over our village at Lyallpur. The route from Lahore to Karachi was right over our village and I knew that I wanted to be in those planes. I just managed to get into Government College, Lahore, which only took first divisioners then. I spent three- and- a- half years there. I was trained in England as there was no arrangement for training in India. We started our training in 1938 and it was supposed to last two years. Then the war started in Europe in September 1939 and we were commissioned in December. 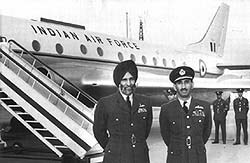 There was a shortage of pilots everywhere — in the Royal Air Force and the Indian Air Force, which had only one squadron at Ambala. Prithipal Singh (from the royal house of Patiala) and I were the last two men to join the RIAF from Cranwell in January 1940…. We were the last to join and complete the squadron. From there I went to Karachi and then to the North West Frontier Province. This experience was like fighting in Afghanistan. The countryside is exactly like in Afghanistan and there are no big targets that you can hit. They are in caves, in the valleys and so on. We flew Westland Wapiti (a bomber/reconnaissance biplane multi-purpose aircraft, typical for the RAF aircraft of the interwar period), Hawker Audax (a variant of the Hart for Army co-operation role, it saw widespread use both in the UK and India. The last Audaxes were used in India and Iraq) and Hawker Hurricane (it combined a biplane structure with a monoplane layout. The Hurricane was sturdy and reliable). At that time, the British idea was not even to have a complete administrative control of the area, but to give a real target to the soldiers. My experience is that unless you see the bullets coming towards you, hitting you, you have never had an experience of war. The first few times that you have these bullets coming, you are afraid. I was afraid. In the first, initial part of any fight, I must say that people get afraid. In fact, in 1940, my Hawker Audax was shot down in the NWF by the Pathans. They used to capture arms, machine guns and so on from British troops. Indian soldiers would rather die than give up their arms. I crashed in a dry stream, a bit like the Ghaggar near Chandigarh, between two hills in which there was a fight going on between the British troops, on one side, and the Pathans, on the other. My gunner, Gulam Ali, a very good man, was injured in the crash. I stayed on with him till he could be evacuated. I am still in touch with him. Gulam Ali lives in Germany now. But it was not much, within two weeks I was flying again — in the same area. Our fighting on the NWF prepared us for the fight against the Japanese. 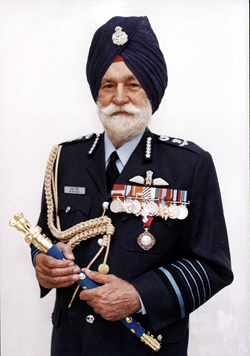 Air Commodore Meher Singh distinguished himself both in the NWF and against the Japanese and was awarded the Distinguished Service Order. 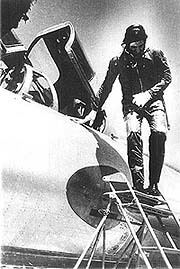 Arjan Singh in a MiG 21 which was inducted into the Indian Air Force during his tenure. I went to Imphal in 1943. By this time I had jumped four ranks and was a Squadron Commander, in the rank of a Squadron Leader. The Imphal Valley was surrounded by the Japanese and the only land route had been cut off by the Japanese. We were provided supplies by the American Air Force, which also used to fly over the hump to China and deliver rations, ammunition and fuel to us. Our squadron was kept in the valley and played a major role in helping the valley withstand the siege. This gave us a chance to prove that the Indian Air Force could fight against well-established enemies. I got the Distinguished Flying Cross (DFC) that was awarded by Lord Mountbatten. Later on, my squadron got eight DFCs—a record among all squadrons, whether Indian or British. The trouble in Jammu and Kashmir started in October 1947. Pakistani tribals started coming into Kashmir, many were regular troops in civilian clothes, fully supported and supplied by the Pakistan Army. Our Army had a very good experience of fighting in the NFW and Burma. However, the Air Force had tremendous confidence. I said: “We just can. If you give orders now, we may be able to attack before night.” We were able to attack the Pakistan troops and, unfortunately, some of our own troops as well. It was a major achievement. The Pakistani objective of capturing the Akhnoor bridge was never achieved. The war was too short! The 1965 war was too short for us. I was disappointed when the ceasefire was announced because in my opinion, the war was going on well for us. We were able to attack every place in Pakistan from here. Pakistan could not send planes beyond Ambala! They could not even reach Delhi, let alone Mumbai or Ahmedabad. We had minimal causalities in the Air Force. It was our experience in World War II that equipped us to fight the war so well. Two of our best fighters were Air Commodore Mehar Singh, MVC, DSO, and Wing Commander K.K. Majumdar, DFC and Bar. Both had experience in World War II. Our country was rather lukewarm (then) about building our defence services, spending on them and arming them. Our ageing leaders at that time had great faith in non-violence. They believed in the goodness of mankind, not realising that once it comes to fighting, you’ve got to fight them out. That’s why we suffered badly in 1962. No doubt, to have modern defence services, your economy has to be strong. Unless the country is secure, unless the business people know that the country will not be easily attacked, let alone defeated, they will never try to establish factories near the border. I think that this was the reason why Punjab, Haryana, Rajasthan and Gujarat did not have that many industries. Now the people know that the armed forces are in a position to defend the county. Pakistan‘s Air Marshal Asghar Khan was a friend of mine. I am still in touch with him. He is a very good officer and we both have a lot of respect for each other. It was during the Rann of Kutch incident in 1964 that Pakistani tanks came into our territory. The IAF did some sorties to find out their positions, etc. But Pakistanis thought that the Indian Air Force would come into play there. Asghar called to suggest that both air forces should not get involved in the fighting. I readily agreed because I had discussed that kind of a situation with the Defence Minister Y. B. Chavan. Both Prime Minister Lal Bahadur Shastri and Defence Minister Chavan did not want a war in the Rann of Kutch because we were not prepared for a war in that area at that time and Pakistanis were well prepared. I was the Chief of Air Staff for five years as against the normal term of three years. After I retired, I was just 50 years old, the government asked me to be the Ambassador to Switzerland. I had first visited the country in 1938 and I had liked the country since I used to go skiing there quite often. I was the Ambassador to the Vatican at the same time, to the court of Pope John Paul VI. We used to have a lot of discussions and he liked me. People often wondered what a military man was doing with a Man of Peace! But he was quite interested in India, Pakistan, and East Pakistan (Bangladesh) and the people there. I was then appointed Ambassador to Kenya. It was a very interesting post because the Kenyans, in direct contrast to the behaviour of Uganda’s Idi Amin, wanted the Indians to stay. The community there was insecure and many migrated to the West. I was able to help people during my tenure as Lieut-Governor of Delhi, though I held the post only for a year. It was during this period that the road signs also came up in Punjabi as Punjabis constitute more than 14 per cent of the population of Delhi. As a Member of the Minorities Commission, my job was to look after the problems of the minorities. I did not have too many problems of the Sikhs since by nature they are problem solvers themselves. However, I must point out that the Muslim community does have many problems of marginalisation. When the anti-Sikh violence took place, I joined other prominent Punjabis in a joint forum and we went to the then President Giani Zail Singh, on November 1, 1984, to ask him to call out the Army. He attempted to contact the Prime Minister and the Home Minister. Unfortunately, the deployment of the Army was delayed till the evening. As a result, many lives were lost. It was a politically-inspired situation and I do not blame any particular community for it. We owned land in Pakistan and were allotted land in Punjab after Partition. I sold off my land because I could not take care of it as I was in service. In fact, when I told Sardar Swaran Singh, in whose constituency my land fell, how much I had sold it for, he chided me for selling it below the market rate. I am in touch with most of my friends and associates, even those whom I knew since Lyallpur days. One should always keep friendships alive. I started reading The Tribune in the ;20s at Lyallpur. When I was in Montgomery this was a popular paper. I came to Lahore in 1935 and started reading both The Tribune and the Civil and Military Gazette. It had military news, whereas The Tribune gave an all-round coverage. These papers played a role in forming my ideas and shaping my attitude towards life. I left Lahore in 1938 and went abroad for training where I read The Times and some naughty papers like the Sun. But I always maintained my contact with The Tribune, wherever I may have been. 1. Apart from the pension of Air Chief Marshal, he is entitled an additional salary of Rs 4,500 per month. 2. He can wear the uniform of the Marshal of the Air Force and can fly a five-star flag. 3. He is entitled to a ceremonial Guard of Honour, Liaison Officer and outriders and accommodation during his visits to Indian Air Force installations. 4. He is entitled to an office and secretarial staff. 5. Although he has no operational role, he serves in an advisory capacity. 6. On his death, he is entitled full military honours for funeral. 7. On ceremonial occasions, he is senior to all bureaucratic appointments. 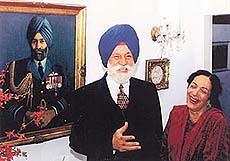 Marshal of the Indian Air Force, Arjan Singh, DFC, has always had a larger-than-life image, and this is one person whose deeds continue to justify it. The Indian Air Force’s only Field Marshal has inspired generations of flyers ever since he joined the IAF in 1939 and was posted to IAF’s Number 1 squadron at Ambala in January 1940, flying in frail Westland Wapitis. The man who led the IAF in the 1965 war has sold off his farm near Delhi, and entrusted a corpus of Rs 2 crore to a trust devoted to the welfare of retired Air Force personnel. Known for personal probity and punctiliousness, the MIAF has set a wonderful example in using personal wealth for the welfare of others. “This is leadership from the front, which the IAF has seen right from the time he joined it in 1939, the gallantry in the Imphal campaign of 1944 and the conflict of 1965. It is unprecedented and completely selfless, which is what his actions have been throughout,” says Pushpinder Singh, editor of the Vayu Aerospace Review. The Marshal of Air Force and Mrs Arjan Singh Trust will seek to open avenues of financial relief for ex-IAF personnel and their dependents who need assistance. The money has been invested in RBI bonds and it is expected that the returns from it will be Rs 16 lakh and “15 per cent of the interest will be added to the corpus and the rest disbursed to those applying for assistance,” says the MIFA. MIAF Arjan Singh, his wife Teji Arjan Singh and their son Arvind Singh will be the trustees for life, but it will be run by the president of the Air Force Association and other ex-officio members of the IAF. The farm that MIAF Arjan Singh sold was the last link he had with land, which was very dear to him. His grandfather, Risaldar-Major Bhagwan Singh, had a farm near Lyallpur, now called Faislabad, in Pakistan, where the young Arjan Singh spent his childhood, watching planes and dreaming of flying one, someday. After Partition, the family was allotted 80 acres of land in Churwali village, near Adampur, Punjab. “I was also allotted a pucca house. Kartar Singh, a good man, used to look after the land and when I sold it, I gave the house to him. I sold off the land because I could not take care of it as I was in service. In fact, when I told Sardar Swaran Singh (the then External Affairs Minister), in whose constituency my land fell, how much I had sold it for, he chided me for selling it below the market rate,” he said in an earlier interview when this writer wrote his biography. The family also had land in Terai, which was tilled by his father Kishan Singh and other family members. “I am no longer a Jat. as you said in the book, I have no land now,” said Arjan Singh, recalling a comment made in the book, written two years ago, that the Jat in him was kept alive by the farm. For this Aulakh Jat, giving up his land is a great gesture, and by setting up a trust for the welfare of others, Arjan Singh has set a shining example in a nation where such things have become rare. He has also instutionalised the trust by ensuring that family members do not run it. 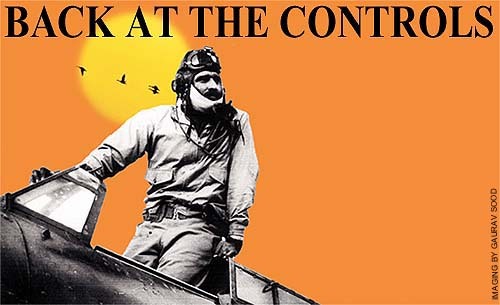 IAF officials —who are more in touch with the current needs— control it. This makes it even more important that his example be emulated. For this a climate has to be created, where such trusts are encouraged. The founder of The Tribune Dyal Singh Majithia set up a number of trusts to serve the public, including The Tribune Trust, Union Academy (later known as Dyal Singh School and Dyal Singh College), Lahore, Dyal Singh Library and Dyal Singh College, New Delhi. The nation, on the whole, had gained a lot from philanthropic trusts like the Dorabji Tata Trust, which helped set up the first cancer hospital in Asia, and the Birla Educational Trust that runs hundreds of primary schools and colleges. Unlike these luminaries, MIAF Arjan Singh comes from a service background. His father, Kishan Singh, a civil engineer, worked in Ceylon Railways. However he has always been large-hearted, and eventually it is not what you have that counts, it is what you give that makes a difference. The IAF will surely remember this magnificent gesture of its Field Marshal for a long time. I have a bit of shocking news for you, said a familiar voice on the phone. “All well, sir?” I inquired, concerned. I immediately said a yes and was present when Marshal of the Indian Air Force Arjan Singh, DFC, was conferred the degree of Doctor of Literature at the 31st convocation of the university at Amritsar on Sunday. Mr Justice Khalil-ur-Rehman Ramday of the Pakistan Supreme Court and Dr Manohar Singh Gill, a former Chief Election Commissioner of India, were also given Honoris Causa degrees. The Latin term means: “for the sake of honour”. The Marshal of the Indian Air Force spoke from the heart when he said that so many years after he left his studies at Government College, Lahore midway because he joined the IAF, he had been given a much higher degree than the graduation that he missed. He is extremely proud of the three years that he was a student of Government College, Lahore, and remembers that period between 1935 and 1938 rather clearly. His experiences there and the learning that was imparted to young Arjan Singh comes through very clearly, and there is much gratitude towards the institution and its teachers in him. Having written his biography, many details are familiar: how he led an austere life, how he chose to live in the Quadrangle, since it was cheaper, games he played and excelled in. He spoke from the heart when he addressed the students at the convocation. “I believe in austerity and hardship during student days,” adding that “hard work is never wasted”. He asked the students to have a simple living and pointed out that the simplest man in the country is President Abdul Kalam, who has not only lived a spartan life, but also does not have any house, anywhere. Even as he made a pitch for the armed forces by telling the students that the forces looked after their own very well, the man who has fought three wars said: “I hate wars.” He recalled how he was among the lucky five out of the 21 who went to fight the war in Burma and said that the only way to prevent wars was to be always prepared for these. “Leadership is never the achievement of one man, but is the cumulative effect of team leaders below,” said the man whom the Indian Air Force still considers its leader, its only five star General. An IAF contingent was present in force during the function. Arjan Singh did not get a degree from Government College, Lahore, but he was educated there, and the result was for all to see at Amritsar. His speech was straightforward, clear and inspiring and it was received amidst thunderous applause. To many attending the convocation, it seemed that Guru Nanak Dev University was only formally putting a seal on the education imparted by another premier institution across the border 70 years ago. The Marshal of the Indian Air Force was conferred a degree, for the sake of honour. He imparts education to those who come in contact with him through his deeds, honourable conduct and speech.